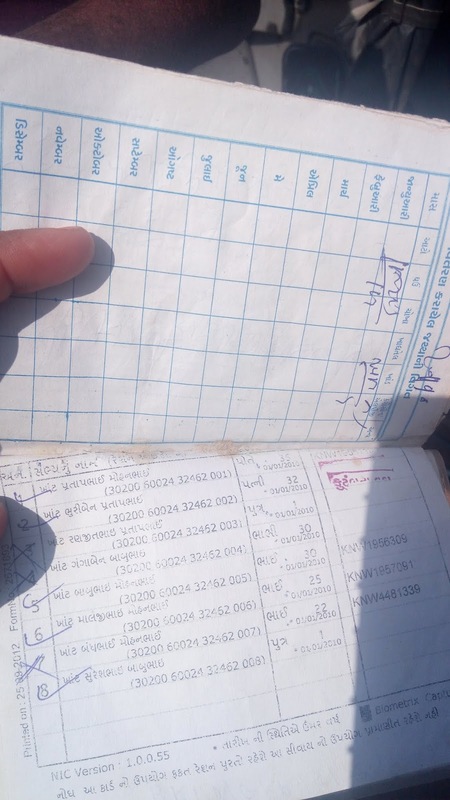 In one of the Fair Price Shops (FPS) at Dalpura village of Danta block of Banaskantha district, the team found that the names have been checked off with black pen for those who do not have aadhaar. When checked with the person at the FPS, he comfirmed that he has been given instructions by the mamlatdar's office that only those to who have aadhaar will get ration under Annapurna Yojana. One of the tribals from Devgadh Bariya block said, "They have been denying ration to us for the last two months on the basis of aadhaar. Many of the villagers do not have aadhaar yet. Reasons are many. Some do not have any documents to show their birth date, some due to old age, some others because their thumbs impression does not match, and there are those who do not have Rs 200 to 500 to travel to block level several times, asking middle agents to fill up their forms."